This note analyzes those proposals: it is a complement to our commentary on the June report of the Secretary-General on Repositioning the UN Development System and to analysis of the gender parity strategy and management reform proposals. The Secretary-General proposes reconstituting DPA as the Department of Political Affairs and Peace-building (DPPA), and DPKO as the Department of Peace Operations (DPO). DPO will manage all large field missions, including field-based special political missions (SPMs) that are currently managed by DPA. DPPA will combine the political responsibilities of the old Department of Political Affairs with the Peacebuilding Support Office (PBSO). It will manage a spectrum of country and regional engagements and partnerships for conflict prevention, peacemaking, and sustaining peace. The regional divisions of DPA and DPKO will be combined in a “single political-operational structure”: the three Assistant Secretary-Generals (ASGs) heading this structure will switch their reporting from DPPA to DPO when a peace operation is established. The proposals resolve the major problem identified by the HIPPO: the presence of two competing departments (DPA and DPKO) that had become both political and operational, with both managing large field missions. Moving the management of large field-based SPMs to DPKO eliminates a major incentive for competition within the Secretariat that had hampered previous planning efforts. The shared regional divisions will remove an obvious example of unproductive duplication. The regional divisions of DPA and DPKO previously duplicated each other’s work, and the move to bring them together is an excellent step. The shift proposed in the management of SPMs should allow a better fit of peace operations to needs on the ground. This change reflects the HIPPO’s recommendations that the UN should be able to deploy a “spectrum of operations” that are highly customized to country context. Relieved of the responsibilities for day to day management of large SPMs, the USG for DPPA should be able to spend more time thinking about broader trends in global peace and security and how to prevent future threats from rising. The movement of the PBSO returns the focal point for peacebuilding to DPPA and gives the department more resources and responsibilities for broader peacebuilding efforts, which are of course by their nature linked to political analysis and strategy. Mission transitions should be made smoother by the merging of the regional DPA and DPKO divisions. While there is some risk that the switch in reporting lines from the DPPA to DPO USGs (or vice versa) when a peace operation begins and ends will disrupt transitions, continuity of strategy and engagement with the host nation should be helped by the fact that the staff working to support the country from the ASG level down will remain the same. This is all extremely sensible, if not earth-shattering. What then are the questions that might be asked as member states consider the proposal? We believe that the major strategic question is the placement of peacebuilding responsibilities. There are pros and cons to the placement of peacebuilding within the new DPPA. As noted above, it may strengthen the UN’s ability to provide higher quality analysis and strategy on conflict prevention and peacebuilding. It may facilitate closer cooperation between the Security Council and the Peacebuilding Commission. Since DPPA would service both intergovernmental organs, it may be an opportunity to address a central recommendation of the Advisory Group of Experts for the Security Council to make much more active use of the Peacebuilding Commission. DPPA will have the ability to present highly coherent and aligned analysis to both bodies. The PBSO gains a link with mediation and electoral support, which may strengthen its analysis, planning, and programming, as well as the UN’s ability to act as a global center of excellence in these areas. 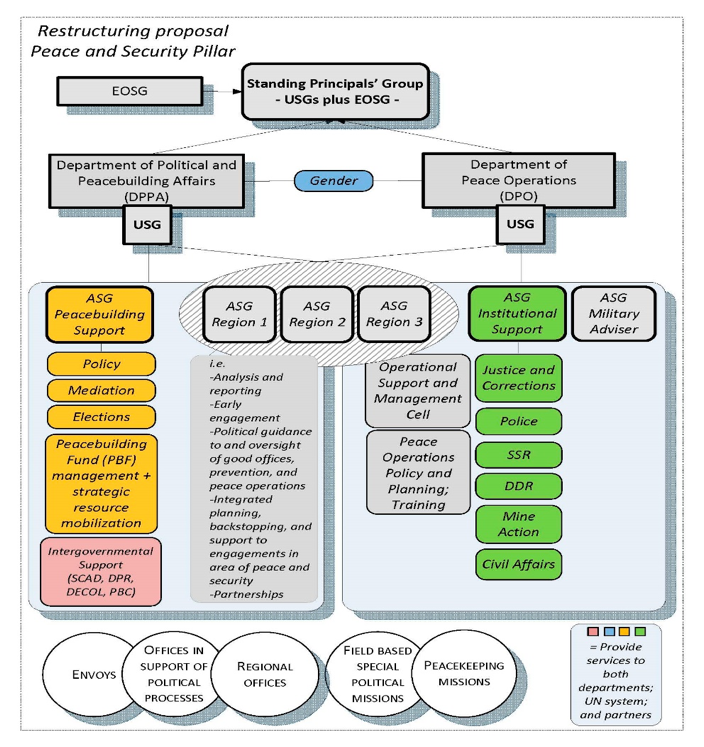 The Peacebuilding Support functions in DPPA are separate from the Institutional Support functions in DPO (these functions correspond to the old office of rule of law and security institutions—compare the parallel green and yellow boxes in the organigram). This is a shame: effective peacebuilding is highly dependent on effective institution building, in particular on security and justice. The Secretary-General apparently considered an alternative reform option that brought together these two offices into a department of peacebuilding and institutional support: this would have had some real strengths for peacebuilding, and it would be useful to think about whether some of the advantages of this link could still be created within the current proposals. The Peacebuilding Support functions will lose their direct connection to the Secretary-General (reporting instead through the USG-DPPA)—becoming part of the peace and security pillar rather than a bridging, cross-pillar entity. These drawbacks may well be compensated by the direct engagement of the Secretary-General in peacebuilding, which he has stressed in the regional briefings this week. A link can also be made with the cross-pillar prevention vision of the Secretary General. This will boost the authority of those working on peacebuilding within the UN. A second important question is on gender. The proposal has a box on gender as a function at the Under-Secretary-General (USG) level, but there are no references to gender functions in the text or explanation as to what will happen to DPA, DPKO, and the PBSO’s staff working on gender issues. A third question is on the link to the management reforms. The Secretary-General’s proposals specifically commit to decentralizing decision-making and delegating authority. This is welcome and is top of the list of the problems identified by many Special Representatives of the Secretary-General and staff in the field. The Secretary-General does not, however, propose a separate set of fiduciary policies and procedures to govern peace operations or all crisis-related field operations (including, for instance, OCHA field presences), which could have been justified given that their need for speed is greater than that of the UN’s headquarters normative and conference-servicing functions. The management reform paper also proposes a separate section of the regular budget for SPMs, indicating that the Secretary-General will not seek to bring together the funding of SPMs with the peacekeeping support account under a harmonized planning and budget structure for all peace operations. The last question focuses on the politics of this reform. This proposal keeps essentially intact the current posts of the USGs for Political Affairs and for Peacekeeping Operations, for many years now held by the United States and France respectively. It differs in this sense from other options, which by proposing a larger reorganization (such as a greater merger of DPA and DPKO) would have threatened at least one of the existing P5 jobs. Is the Secretary-General wise to avoid this, or by contrast is he missing an opportunity to dislodge the P5 from their hold over particular UN jobs and to move to a more diverse and merit-based system? In conclusion, these proposals are a clear improvement over the current structures. They are not as bold as the development and management system proposals, but they still constitute significant reform. Ensuring that they deliver a more effective UN response to threats to international peace and security and to the more universal challenge of sustaining peace will depend on hands on leadership from the Secretary-General and a mindset change that goes well beyond boxes in the organigram. The Secretary-General has the strategic leadership to make this work, but it will need his ongoing attention. Download the full commentary UN Peace and Security Reform: Cautious Steps in the Right Direction. Find more resources and commentary on Multilateral and UN Reform.